Fiza Pathan is a teacher and an award-winning author of nine books: S.O.S. Animals and Other Stories, Treasury of Bizarre Christmas Stories, Classics: Why we should encourage children to read them, Nirmala: The Mud Blossom, So This Is Love - Collected Poems, Classics: How we can encourage children to read them, The Flame Will Always Burn-Selected Poems, Amina: The Silent One, Raman and Sunny: Middle School Blues, and “Flesh of Flesh” (Short Story). Her books have placed in many prestigious international awards: Readers’ Favorite International Book Awards, Reader Views Literary Awards, Mom’s Choice Award, Beverly Hills International Book Awards, Eric Hoffer Book Award, Foreword Reviews INDIEFAB Book of the Year Awards (Finalist), Next Generation Indie Book Awards (Finalist), etc. 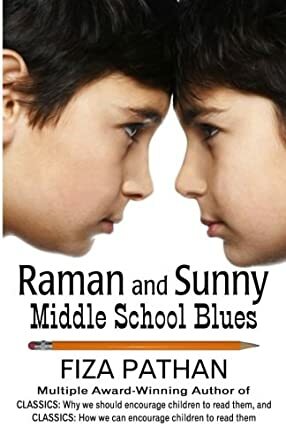 Raman and Sunny: Middle School Blues by Fiza Pathan is a middle grade story set in Mumbai about two twins, Raman and Sunny. When they begin middle school, the twins start fighting among themselves. They want their own individuality and no longer want to be seen as part of a pair. But when the pair drifts apart, the bullying begins. Before, their strength was in their tight bond, but now their separation leads to resentment, irritability, and destructive behavior, especially for the mild mannered Raman. Things looks like they are going to spiral desperately out of control until a new teacher comes on the scene who believes in new, creative ways of teaching that can actually engage a child's mind. With the philosophy "Question, Research, Debate," teacher Sunil Sir unites the children once again and teaches them valuable lessons about family, life, and love. This is a very deep book that deals with a multitude of woes for the tween age group: starting middle school, a child's individuality, parenting choices, the ways teachers and educators choose to respond to students, jealousy, resentment, fear of change, bullying, defiance and disrespect. It offers real life situations showing these examples and talks about the good and bad things that can happen in each situation. It shows young readers how one might traverse these situations and the outcomes that can result when right and wrong paths are chosen. Overall, it is a very educational book that parents will feel good about their children reading.